As the fall season gets under way, attention tends to focus on major cities like New York and London because of their blockbuster museum exhibits and trophy-art auctions. The vagaries of the art market hold greater sway there, with galleries opening and closing with every tilt in collector confidence. Yet beyond these global hubs, there exist smaller, self-sustaining art scenes that appear to thrive in good markets and bad. Santa Fe, N.M., is one such “microclimate.” Aspen, Colo., is another. Some hot spots, like Palm Springs, Calif., benefit from vacation-worthy vistas or cheery climates, but other settings may come as a surprise. Arts researcher Zannie Giraud Voss, who directs the DataArts team at Southern Methodist University, said its latest index of culturally vibrant cities includes places like Traverse City, Mich., population 15,532. Traverse City sits a few miles away from the Interlochen Center for the Arts, and it boasts a film festival, symphony orchestra and a museum with one of the world’s top collections of Inuit art. Rapid City, S.D., also made the Arts Vibrancy Index in part because it is close to Mount Rushmore. Khristaan Villela, director of Santa Fe’s Museum of International Folk Art, said the city’s artists and collectors no longer feel compelled to travel to either coast to feel like they’ve participated in a lively art season—a departure from perceptions a generation ago, he said. The homegrown focus buffers some galleries from the swings of the broader art markets, but it also allows regional styles and quirks to blossom. Here is a look at five cities that have cultivated their own artistic identities. Known For: Indigenous and Hispanic artists settled here long before Georgia O’Keeffe, and today it brims with at least 100 galleries, eight museums—including one founded in 1917 when the population was around 5,000 people—and seasonal market events offering everything from Pueblo pottery to contemporary art. Local Hero: Cannupa Hanska Luger was born on North Dakota’s Standing Rock reservation, but he lives in Santa Fe and makes pieces like “Every One,” a vast curtain made from apple-size clay beads representing missing or murdered indigenous women. Strung together, the beads reveal a portrait of one Native woman. Insider Tip: Former Sotheby’s chairman John Marion and his wife, Anne, bought a home in Santa Fe in the 1980s, helped found the Georgia O’Keeffe Museum in 1997 and recommend strolling the galleries along Canyon Road. Hungry? Eclectic American restaurant Geronimo “puts Tex-Mex to shame,” Mr. Marion said. Known For: This former silver-mining boomtown and ski resort is now a playground for the world’s top collectors, so the trading-post shops are steadily making way for blue-chip galleries like Baldwin, Marianne Boesky and Casterline Goodman. Young upstart Skye Gallery just offered a plant-foraging hike with one of its artists. Must-See: After three decades of squeezing contemporary-art shows into a former power plant, the Aspen Art Museum tripled its footprint when it opened in a new home designed by Pritzker Architecture Prize winner Shigeru Ban. Taste-making director Heidi Zuckerman has works up now by artists like Yto Barrada and Larry Bell. Local Hero: Soaring real-estate prices keep most working artists from settling here, but Texas-born James Surls has a studio in nearby Carbondale, where he’s known for sculpting wood into oversize flower petals and house shapes. More than 50 of his works are on view through Sept. 29 at the Southern Utah Museum of Art. 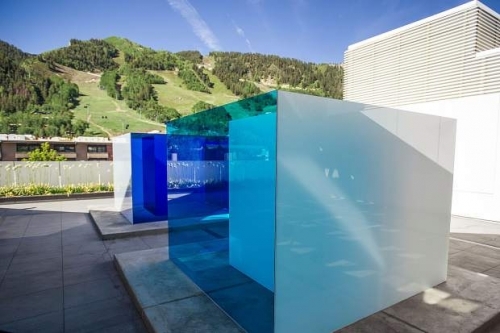 Insider Tip: Collector Eleanore De Sole sent her summer visitors to ride a gondola in nearby Snowmass up to the Elk Camp restaurant to see Sarah Cain’s abstract installation, “Mountain Song,” on view through Sept. 30. Ms. De Sole also recommends a day trip to “see the world’s best collection of Jasper Johns’s works on paper” at the Powers Art Center in Carbondale. Known For: This Midwestern city is beloved for its jazz and barbecue, but artists Thomas Hart Benton and Robert Morris lived here, and the Kansas City Art Institute’s robust ceramics program has spurred generations of collectors to pay as much for pottery as they might a painting. Longtime dealer Sherry Leedy said she no longer shows at far-flung fairs because her existing supporters can sustain her artists’ careers. Must-See: Kansas City has a population of almost 500,000, coincidentally around the number of annual visitors to the Nelson-Atkins Museum of Art. The museum is prized for its Caravaggio, “Saint John the Baptist in the Wilderness,” as well as its edgy contemporary shows. Up now: Exhibits on Missouri natives Wendell Castle and Wilbur Niewald. Local Hero: Kansas City-born artist Andrzej Zieliński explores the ways machinery can make people anxious by re-creating copiers, paper shredders and other gadgets using warped sheets of translucent plastic. The Yale graduate currently has a show, “Indoor Habitat,” up through Oct. 2 at Emporia State University. Insider Tip: Kansas City this month launched a new citywide biennial, “Open Spaces,” with 46 artists—half of whom hail from the region. Collector Bill Gautreaux said he admires the local focus and recommends Ebony Patterson’s “…called up,” an abandoned swimming pool that the artist cleaned up and festooned with flowers, and Kansas City Art Institute alum Nick Cave’s “Hy-Dyve” installation in a former Catholic church. “Open Spaces” runs through Oct. 28. Local Hero: Architect Hugh Kaptur was a young apprentice during Palm Springs’ midcentury heyday, but he stuck around, designed homes for actors Steve McQueen and William Holden and at age 87 is still renovating his buildings and designing new ones today. Insider Tip: Mr. Phoenix and Lisa Vossler Smith, Modernism Week’s executive director, said visitors should get outfitted in country-club attire at Trina Turk’s boutique before loading up on Peninsula Pastries (“It helps offset the cocktails,” Mr. Phoenix said). Brush up on midcentury everything at the Palm Springs Art Museum Architecture and Design Center—or step into a primer by visiting Walter and Leonore Annenberg’s 200-acre winter estate, known as Sunnylands, in nearby Rancho Mirage.